The design of the Commonwealth flag reflects the close ties that bound the Cuban and Puerto Rico patriots in the 19th century for the flag which waves over the Capital of San Juan is the Cuban flag color reversed. The flag was first used on December 22, 1895. A group of 59 Puerto Ricans led by Dr. Julio J. Henna, gather at "Chimney Corner Hall" in Manhattan, New York City and organizes a political group, attached to the Cuban Revolutionary Party, which advocated independence for Puerto Rico and Cuba from Spanish rule. As part of their activities, a flag was created to rally support for independence from Spain. The flag was soon adopted as a national symbol. In 1898, the flag became the mark of resistance to the US invasion; and in the 1930s it was adopted by the Nationalist Party. When Puerto Rico became a Commonwealth in July 25, 1952 it was officially adopted as the national flag. 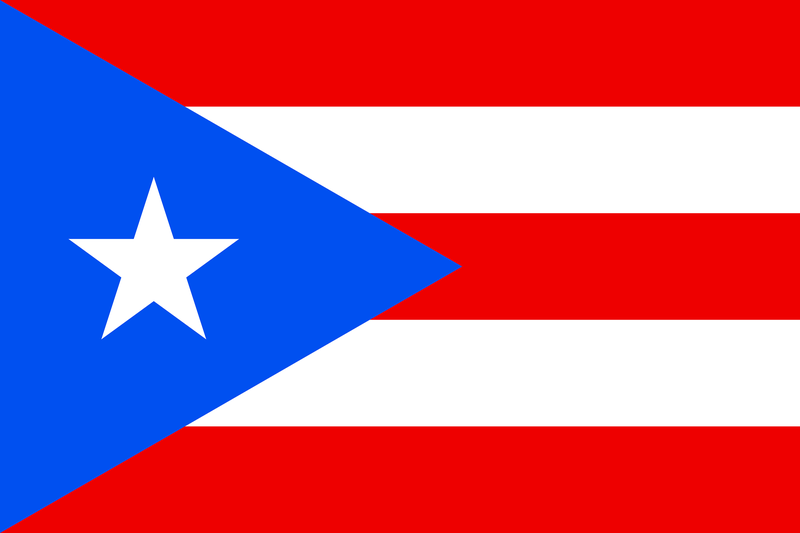 The Puerto Rican flag consists of 5 alternate red and white stripes. On the left of the flag is a single white five-pointed star resting in a blue triangle. The symbolism is explained thus. The white star stands for the Commonwealth of Puerto Rico while the three sides of the equilateral triangle together represent the three branches of the Republican government (executive, legislative and judicial branches). The three red strips symbolize the blood that feeds those parts of the government. The two white stripes symbolizing the rights of man and the freedom of the individual, are a perpetual reminder of the need for vigilance of a democratic government is to be preserved. The flag is not flown except in company of the U.S. flag. Adopted in July 25, 1952. Did you know that the original design used a sky blue tone of the triangle in the Puerto Rican flag? But when the flag was adopted officially by the Commonwealth in 1952 it featured a dark blue very similar to that of the US flag. This fact has raised many issues whether to use a sky blue tone or a dark blue tone in the flag. Recently, with the celebration of the flag's 100 anniversary in 1995 the current administration displayed a flag with the original sky blue tone. Some historians concluded that the reason why a dark blue was used in the 1952 flag was related to the origins of the flag and its relationship with a revolutionary independence movement. The identity of the flag's author has been reason for many debates, possible authors: José del Matta Terraforte, Antonio Vélez Alvarado, Manuel Besosa and/or Gonzalo (Pachín) Marín. Soon after the Cuban Revolution (1950's) US officials in the island became suspicious of those who displayed the flag, considering them subversives. Police used to arrest anyone displaying the flag on charges of insubordination against the United States.